[Updated: 17th Feb 2016] Following on from my recent post on how to reclaim disks that were previously used by VSAN, I was asked how one can remove a disk group from a host that is participating in a VSAN [5.5] cluster. 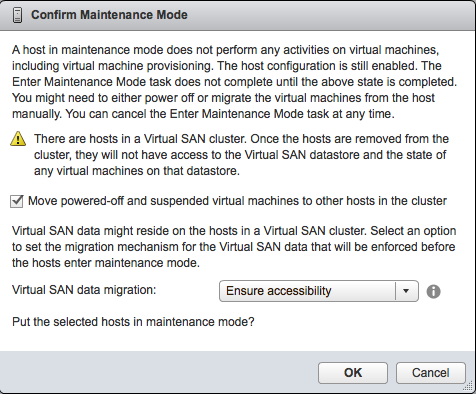 This is quite straight forward, but there is one minor caveat and it relates to whether the VSAN cluster has been setup in Automatic Mode or Manual Mode. If you want to learn more about the behaviour of the different modes, you can read up on it here. You are now prompted with various option related to maintenance mode. You can read more about these options in another post I did on maintenance mode here. Once this step is completed, [and all the data is evacuated from the host], the host is now in maintenance mode, and you should be able to remove the disk group. However, the icon to remove the disk group is not visible in the Disk Groups view. The reason for this is because the cluster is still setup in ‘Automatic’ mode, which means that if we removed a disk group, VSAN would immediately claim the disks once again. So you will need to place the cluster in manual mode for the “Remove the disk group” icon to appear and thus remove the disk group. 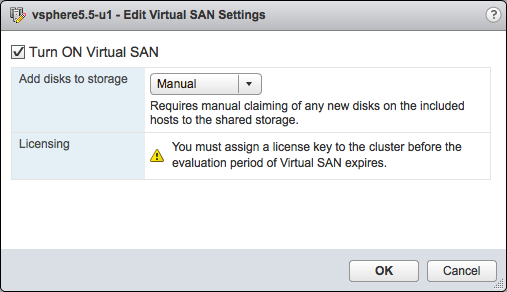 Pingback: VSAN Part 17 – Removing a Disk Group from a Host - VSAN Me!